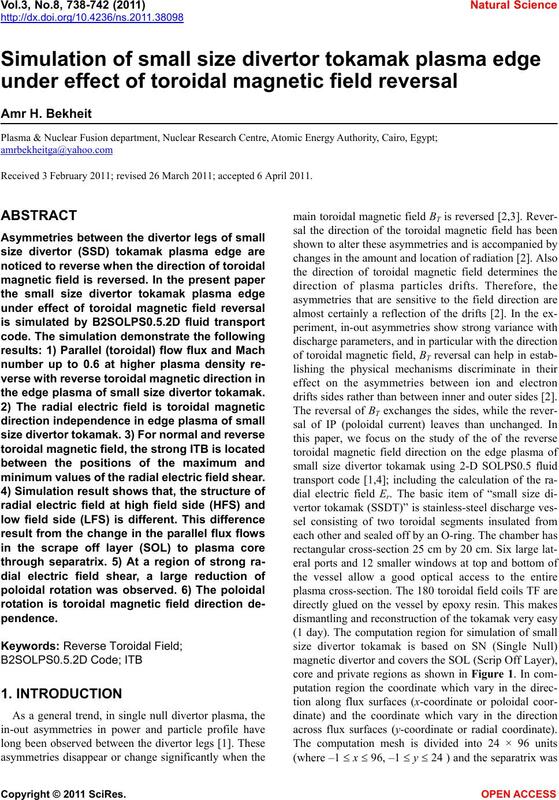 Received 3 February 2011; revised 26 March 2011; accepted 6 April 2011.
the edge plasma of small size divertor tokamak. minimum values of the radial electric field shear. drifts sides rather than between inner and outer sides . across flux surfaces (y-coordinate or radial coordinate). tokamak (B drift of ions directed towards the x-point). and their influence on the plasma state can be examined. 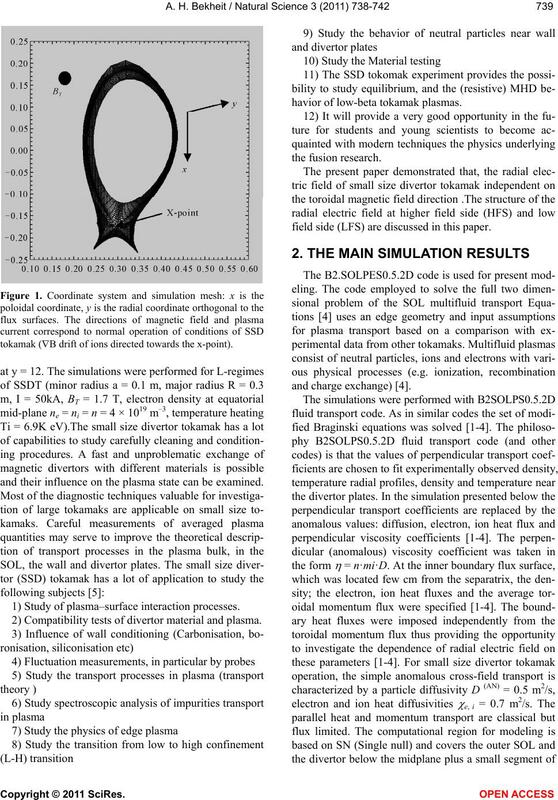 1) Study of plasma–surface interaction processes. 2) Compatibility tests of divertor material and plasma. havior of low-beta tokamak plasmas. field side (LFS) are discussed in this paper. ent of the direction of toroidal magnetic field BT. on plasma electrostatic potential at (HFS) and (LFS). through separatrix. This result agrees with the result . at (HFS) in edge plasma of SSDT. at (LFS) in edge plasma of SSDT. poloidal rotation was observed as shown in Figure 9. Figure 10. This result consistent with results of [6-8]. 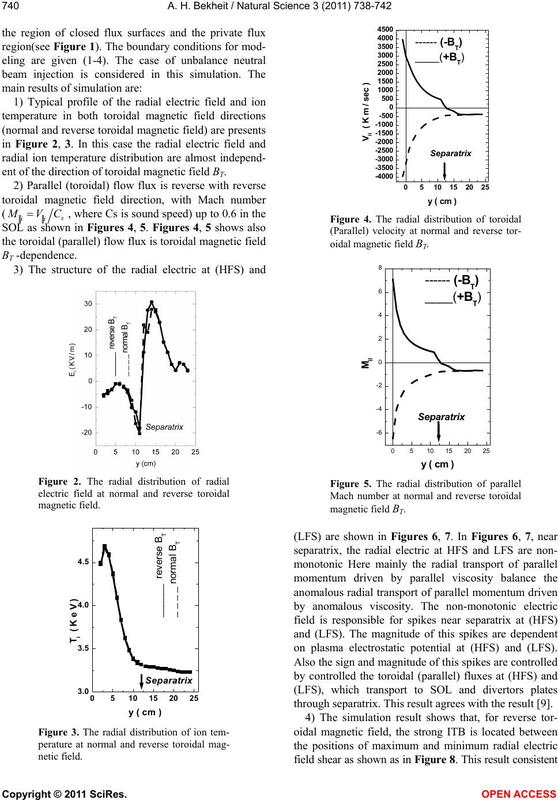 pendence as shown as in Figure 10.
toroidal magnetic field, with Mach number up to 0.6.
kamak (SSDT) is toroidal magnetic field independence. in edge plasma of small size divertor tokamak. port to SOL and divertors plates through separatrix. consistent with the result . plate. This result consistent with results of [6-8]. field. Jouenal of Fusion Energy, 27, 338-345. Physics Control Fusion, 37, 1389-1406. Plasma Physics Control Fusion, 37, 1853-1864. Schneider, R, Rozhansky, V. and Voskoboynikov, V.
mak, Nova Science Publisher, Hauppauge. Boedo, J. (1999) Convection in the DIII-D Divertor. ties of internal transport barrier formation in JT-60U. 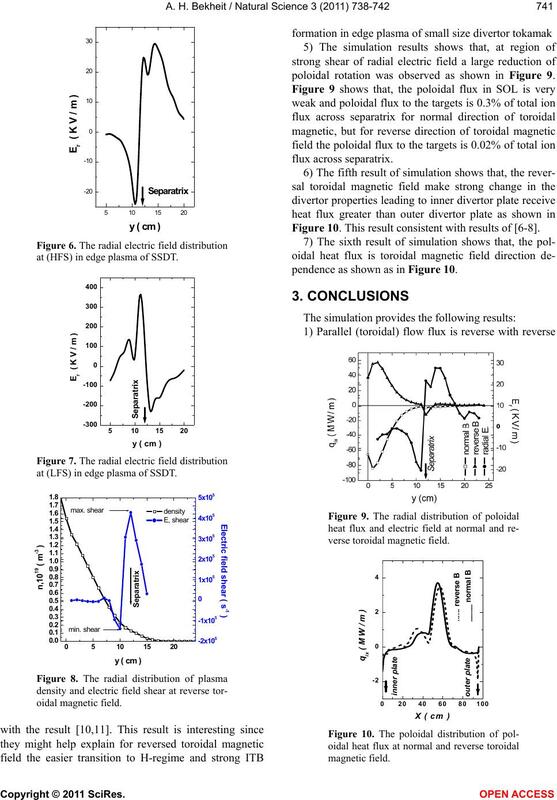 Journal of Nuclear Fusion, 44, 876-882.
kamak. 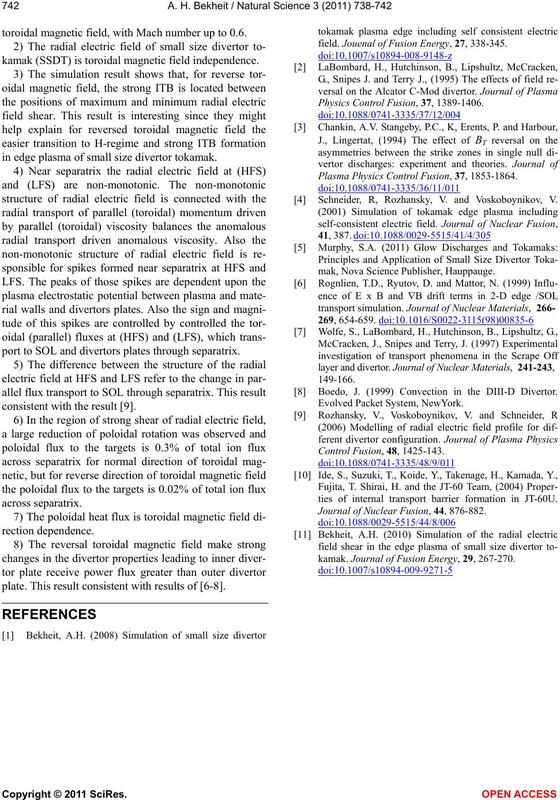 Journal of Fusion Energy, 29, 267-270.